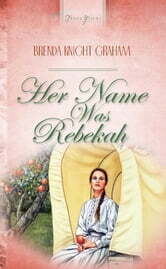 Rebekah believes her husband married her for her name - that Rebekah went with his Isaac as a crazy sign from God. Now she regrets saying "I do" and wants only to reclaim her family's property from the bankers. At the time, marriage seemed better than homelessness. But now, as the wife of a traveling dentist who treats her like a guest in his wagon house, she longs for something more. Rebekah would do almost anything to regain her former life. Isaac Aden Robards lives his life to serve God and His people. He wants Rebekah to return his affection and to know his Lord. But will she stay long enough to do either? Or will her obsession with "home" destroy her chances for real love?